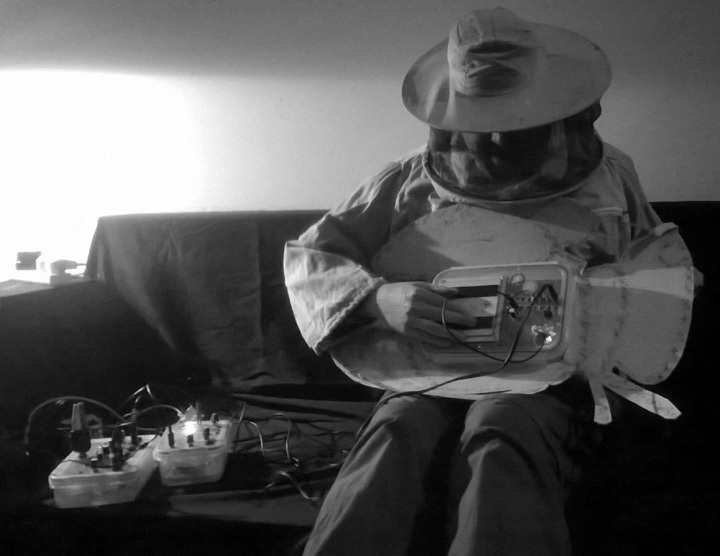 Bioni Samp – performing on the couch at Divus Art Gallery London, with ‘theBee’, Baby Bee Synth, Single Cell Synth and Hex Mixer. Also my sound installation ‘Bee Cannon’ is at the gallery for a few weeks. Sound Installation, mixed media, sculpture, 1m x 8cm x 8cm. As visitors to the gallery walk past the ‘Bee Cannon’ the sound of bees buzzing emanates, calling our attention. Bee sounds are amplified and distorted by the tube hive / cannon, which is positioned next to the gallery door at ear height. Everyone who enters / exits the gallery, hears a blast of spring bee frequencies. Inside the replica tube hive (a common hive design, usually made of ceramic pipes or logs, in Africa and middle east) the recycled phone acts as a mp3 player on a loop. 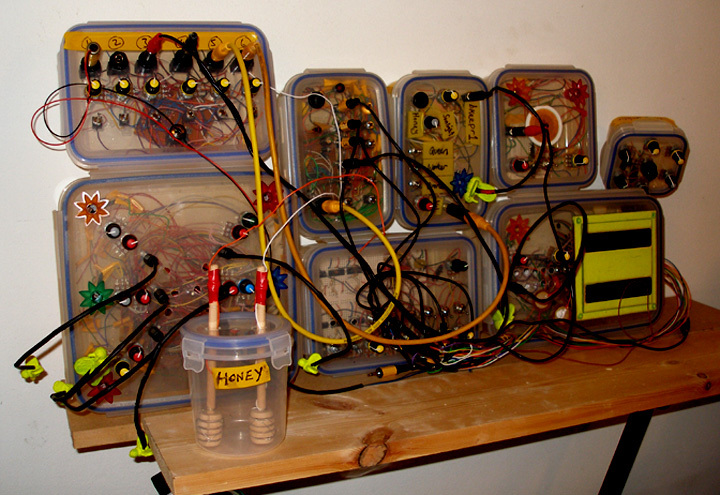 Playing a recording of two of my beehives, both of which were recorded simultaneously. Hive A to channel 1, hive B to channel 2. Every now and then, during the time of hibernation, I can phone up the replica tube hive / cannon and talk to the bees and hear them buzzing, mainly because I usually spend the winter worrying about my bees.